Probably the reason Dave Wildman has got so much out of motorcycling is that he put so much into it. From early days onwards he’s been drawn by the thrill of competition. During his teenage years Dave was a spectator at the Brands Hatch race track not far from his home in his native England. He watched the likes of a young Stirling Moss long before he became the world-famous Sir Stirling, and the seed was planted for his own racing career that took a few more years to materialize. Dave and his new bride Pat emigrated to Canada for better opportunities and arrived in Vancouver in early 1952. Their new home offered nothing like the full motorsports calendar they had previously enjoyed, but later that year Dave became a competitor in local trials events on his 200 cc James. 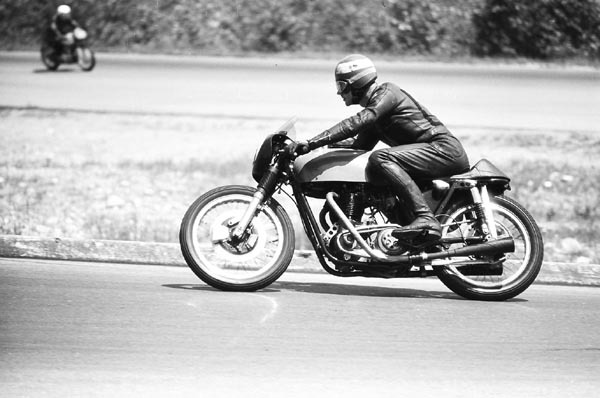 His main interest being in road racing, in 1953 Dave entered the James in an event at the Abbotsford airport, that being the only type of paved circuit available at the time. The airport was still a military property and donation of race proceeds to the air force benevolent fund helped ensure continued access over the next four years. It was only the second year of operation for the B.C. region of the Canadian Motorcycle Association; previously events were sanctioned by the AMA, which was controlled by the American manufacturers and whose main interest was in dirt track. As the token Englishman and on an English motorcycle, Dave earned the nickname of Teabags. It was quite a change from what Dave was used to, but in ‘53 he succeeded in winning the 200 cc Dominion championship, forerunner of the national championship. 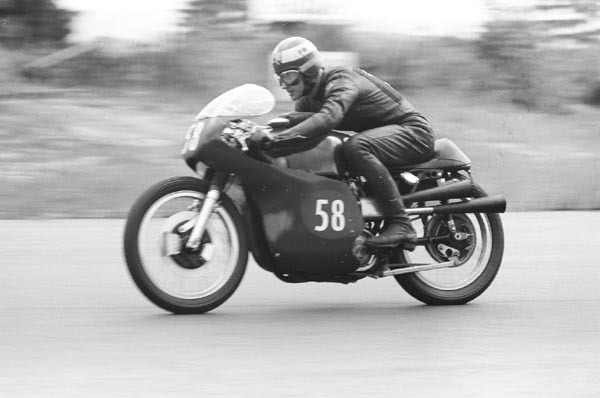 The next year he graduated to a Norton Manx and became a regular winner in the 500 cc class, including the last race held at Abbotsford in 1957. 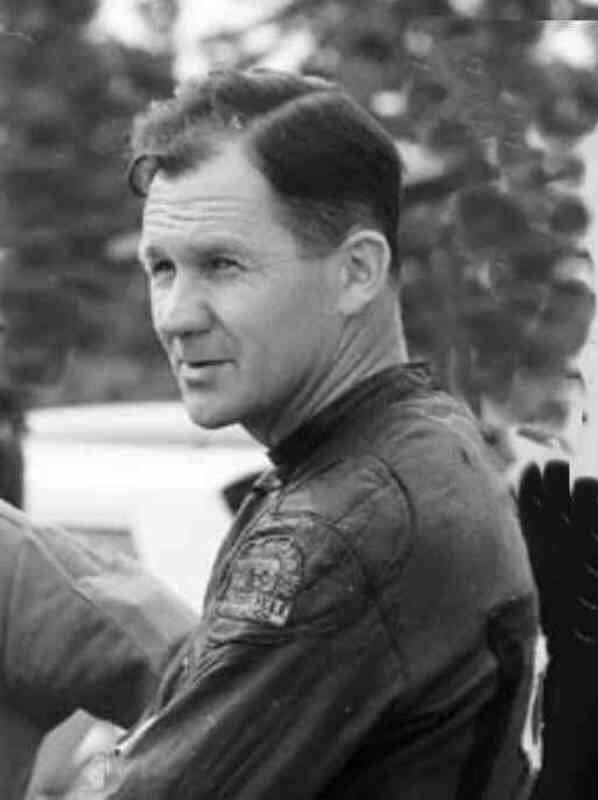 The next year there were no road races in B.C., but in 1959 the new purpose-built Westwood circuit opened and Dave, as president of the B.C. Motorcycle Racing Club, was first on to the challenging new 1.8 mile track. Over the next three decades Westwood was to be the scene of many victories for Dave on his Norton and Triumph solo machines and Triumph sidecar outfits, and finally another Triumph solo in vintage racing before the track closed in 1990. Dave inspired his two sons John and Ashley to join the world of motorcycle racing, not least by taking them at a young age to what in the 1960s was the world epicentre of road racing, the Isle of Man. 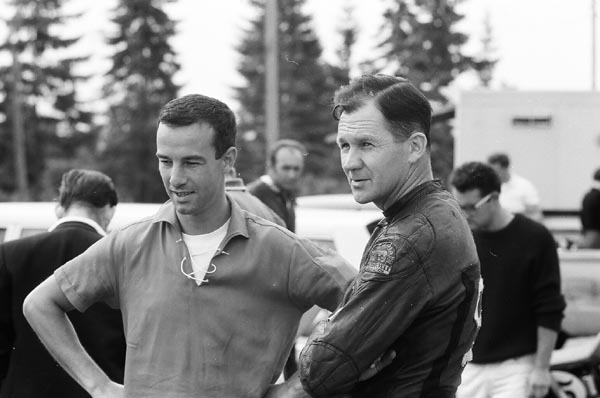 In what must have been a major upheaval for the family, Dave and Pat spent the summers of 1960, ’61 and ’62 racing in the U.K. and winters back in Vancouver. At the time the CMA had a TT rider fund to help with expenses, and Dave repaid the favour by winning the Junior TT team prize in ’61 and ’62 as part of a three-rider grouping with Mike Duff and English rider Roy Ingram. After the death of family friend Tom Phillis from Australia in the 1962 TT, Dave and Pat decided that was enough and came back to Vancouver to stay. 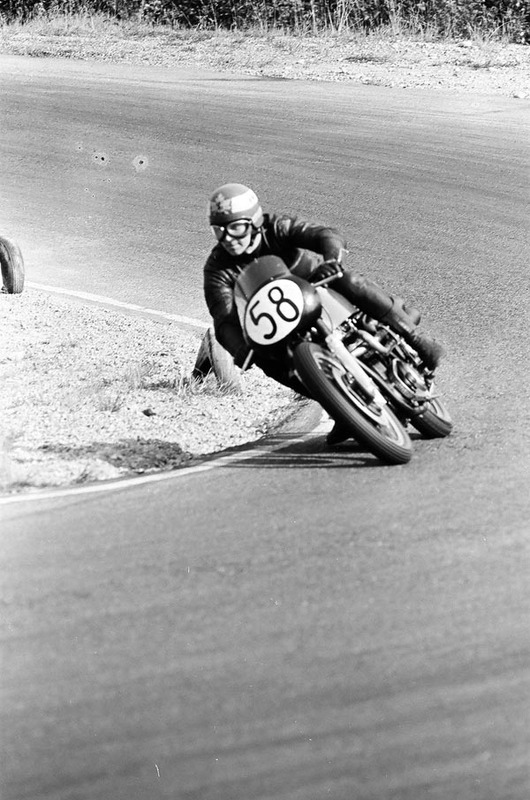 Dave raced at Mosport in Ontario on their way back west but his Matchless G50 retired with a broken piston. 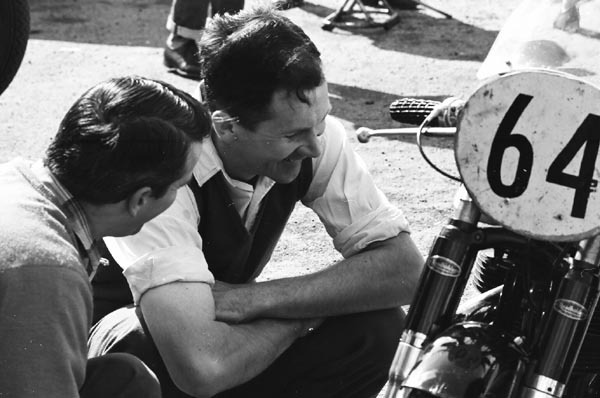 In 1966 he went into partnership with fellow racer Ted Havens, opening Cariboo Motorcycles in Port Moody. In its early days the shop sold Ossa, Ducati, Bultaco and Hodaka, then took on Triumph and became its most successful dealer in Canada for seven years. Dave later bought out his partner and nowadays Cariboo is exclusively a Harley-Davidson dealer, still run by the Wildman family. Dave’s chosen racing mounts through the 1970s were Triumphs and he achieved notable success in production events with the 750 cc Trident. In 1974 Dave switched to sidecar racing, which he found particularly enjoyable for its off-track camaraderie as well as for its wheel-to-wheel competition. His son Ashley was a frequent passenger on the rig. Dave also served various terms as president and treasurer of the Westwood Motorcycle Racing Club, as well as being region vice-president of the CMA and region referee for both road racing and motocross. 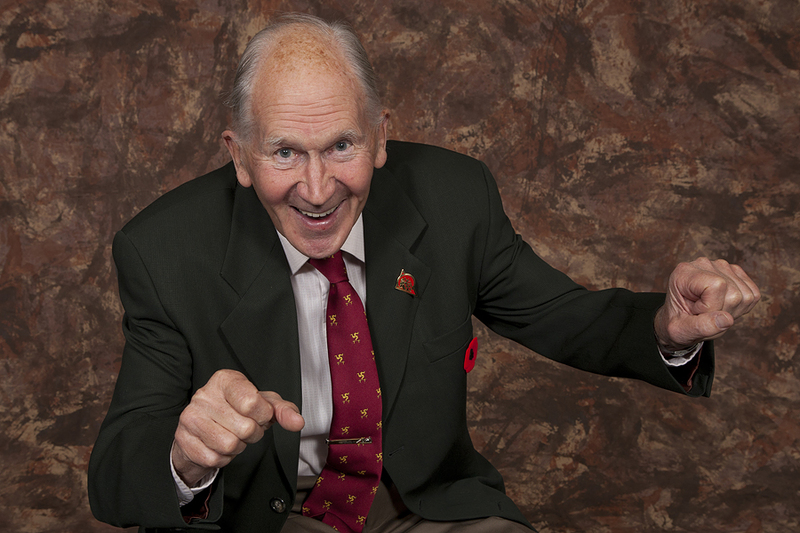 After close to four decades his racing career ended with the much-lamented closing of Westwood when the B.C. government sold the land for residential development. Before hanging up his leathers at age 62 Dave enjoyed a final victory in the 500 cc vintage class on a Triumph he’d rebuilt from a $300 pile of parts. With long-time friends and rivals Murray Neibel and Pete Kellond hot on his heels, it was almost like the old days.